Update your home or business’s old, dull flooring with new luxury vinyl flooring in Middletown, DE. By replacing your outdated and run-down carpets or laminate floors with gorgeous new luxury vinyl tile or plank flooring, you’re able to improve the look and value of your entire home. Visit our showroom to view a variety of LVF samples and schedule luxury vinyl flooring installation with our professionals. If you’re unsure which style of LVF will work best with your existing décor or the rest of your home, feel free to discuss your project with our sales and design professionals. We’re able to help guide you to the perfect flooring style to suit your needs and personal design preferences. Why Should You Choose Luxury Vinyl Flooring? 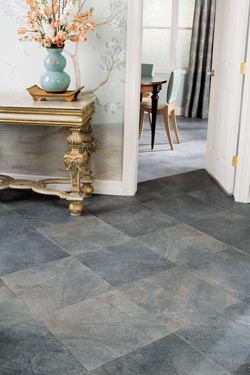 Vinyl flooring has been a trusted and popular flooring material for several decades. With modern manufacturing advances, however, it’s greatly improved its versatility and appearance. Because it is a printed material, luxury vinyl flooring is capable of mimicking a wide range of materials including hardwood, stone, ceramic, and even marble. Whether you prefer the look and texture of hardwood in your dining room or the appearance of marble tiles in your bathrooms, we’re certain to have a style of LVF to suit your needs. Whether you choose luxury vinyl tile or luxury vinyl plank flooring, we carry LVF in many sizes, shapes, and appearances. Hardwood is a very popular flooring material due to its sophisticated and comforting appearance. However, many people are intimidated by its price tag or maintenance needs. With luxury vinyl plank flooring, you can enjoy the rich tone, feel, and elegance of exotic hardwood without the cost, maintenance requirements, weight, or environmental impact. Plus, by adding elegant luxury vinyl plank flooring, you’re also increasing the real estate value of your property. After choosing your stylish new flooring, be sure to schedule luxury vinyl flooring installation with our skilled professionals. We make sure to properly remove your old flooring, prepare the subfloor, and install your new vinyl flooring so it lasts for many long years. By leaving installation to us, you can rest easy knowing you’re covered by our Lifetime Installation Guarantee. This means that if you experience problems with any flooring installed by us, we’ll make it right at no cost to you. Contact us to schedule luxury vinyl flooring installation with a skilled professional. We’re proud to serve clients in Middletown, DE, as well as the surrounding areas.